Canon EOS 77D Mirror less Digital Camera with 18-135mm digital camera settings may be done nearly right away. Ordinary iso pace as excessive as iso 25600 is found out way to digic 7, which contributes to lovely pics and movie pictures with minimal noise and camera shake. Fast and specific autofocus is likewise feasible no matter shooting style. Disclaimer : Canon Eos 77D 18-135mm DSLR Camera price in Pakistan is updated on daily basis and rate/price for Canon Eos 77D 18-135mm DSLR Camera is valid for all cities of Pakistan included Islamabad, Rawalpindi, Lahore, Karachi, Faisalabad, Peshawar, Sialkot, Quetta etc. 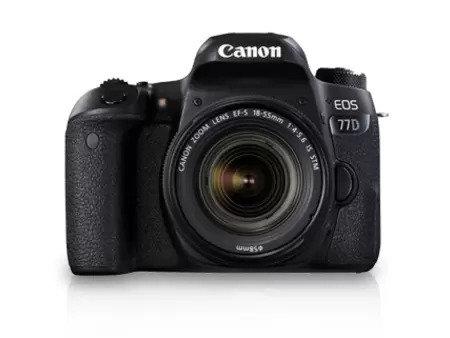 Canon Eos 77D 18-135mm DSLR Camera price depends on many factors thats include the price of dollors, manufacturar price and import cost and duties etc. Our team entered specs from diffrent resources and not responsible for any typo error in specs for Canon Eos 77D 18-135mm DSLR Camera, please report any such error in bug report panel for Canon Eos 77D 18-135mm DSLR Camera. Canon Eos 77D 18-135mm DSLR Camera price in Pakistan.